In the context of a wave of struggle and protests in the run-up to the World Cup, the São Paolo metro workers began a powerful strike on 5 June. This struggle, which goes beyond the fight for better salaries, representing a struggle to defend the right of public transport for the population, is currently at the center of national attention, and suffers brutal repression at the hands of the state. The strike began precisely on the anniversary of the beginning of last year’s massive June protests. Last summer, millions took to the streets in hundreds of cities throughout the country in a revolt which began over an increase in transport prices. As a result of this social explosion, different local and state governments were forced to revoke the price hikes, but they did not halt the process of neo-liberal wrecking and privatization of public transport. From June 2013, a new upward cycle of working-class struggles opened up in the context of growing economic crisis and the dead end of the economic and political model of the governments of the PT (the Workers’ Party of both Lula and Dilma). Struggles have been more fragmented since then, but have acquired a clear class profile. Innumerable strikes throughout the public and private sectors of the economy have exploded since then. In addition to the sectors of workers with strong union traditions of struggle (teachers, civil servants, bank, postal, metallurgical sectors, etc. ), more precarious sectors which have more difficulty in developing trade union organization, have also occupied the epicenter of the struggle. Such was the landmark case of public cleaning workers in Rio de Janeiro, who staged a strike in during the “carnaval,” facing the brutality and repression not only of the town hall of Rio de Janeiro but also of the pro-government trade union bureaucracy. With enormous popular support for their struggle, the “sweepers” (as they are called) won a huge victory, stimulating similar struggles in other cities of the country. This was also the case for about 28,000 workers providing services in the Rio de Janeiro Petrochemical Complex. 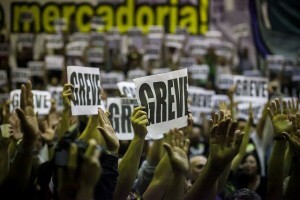 Likewise, bus drivers in Rio de Janeiro and São Paulo staged strikes, going over the heads of their union leaders. Right now, several sectors of workers are in struggle and many on strike. 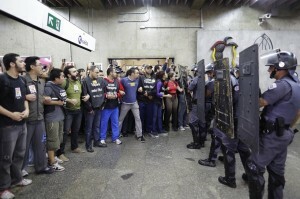 One of the stronger strike movements is in state universities of São Paulo, in particular the University of São Paulo (USP) with intense mobilizations of students, teachers and staff. In recent weeks, the focus of attention has been on the demonstrations headed by Homeless Workers Movement (MTST), mainly in São Paulo. At dawn on 3 May, the MTST led a massive occupation of land, intended by its owners for mere speculation. The land is located less than four miles from the stadium that will host the opening of the World Cup in Itaquera neighborhood, east of the city of São Paulo. Situated so close to a stadium that cost nearly one billion Real (400 million dollars), the occupation expresses the contrast between public spending intended to boost the profits of FIFA, the major builders, and real estate speculators on the one hand and the precarious living situation of workers on the other. Dubbed the “People’s Cup,” the occupation in Itaquera today involves about 4,000 families. With the World Cup there was a big increase in real estate prices (up to 200% in some areas of the city) and large rent increases. Millions of workers are forced to leave their homes and live further away from their workplace, further exacerbating the problem of urban mobility in a city like São Paulo. Therefore, the demands for the right to housing and transport are part of the same struggle for the right of workers to their own city, rather than the city being controlled by companies. The MTST was able to organize marches of thousands of homeless workers and allies to defend their claims. 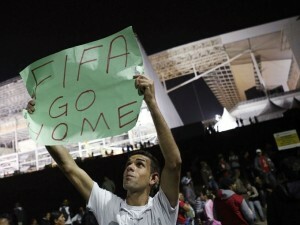 The last one took place on 4 June, when 25,000 people blocked access to the new stadium a week before the World Cup’s opening. 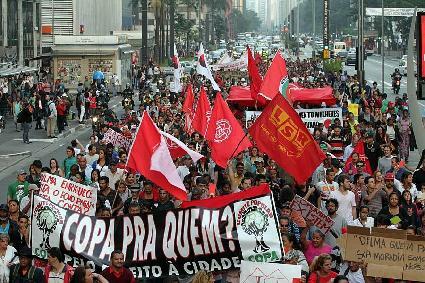 This demonstration made clear the strength of the movement that could even threaten the very opening of the World Cup. A few days before, the threat of forced eviction from the site Itaquera warned of a bloodbath, as the movement had opted for resistance. 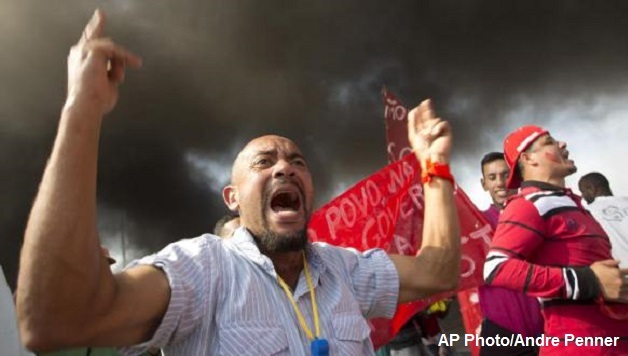 But shortly after 4 June, the federal government of President Dilma Rousseff (PT – Workers’ Party) sought to open negotiations and indicated that the government would meet the demands of the movement. The land occupied by the “People’s Cup” should be allocated to the construction of affordable housing with public funding under the administration of the movement itself. Once this retreat of the government is confirmed, the resounding victory of the struggle of MTST will pave the way for new struggles of various movements going forward. It is in this context that the Metro workers’ strike takes place. In this case, the direct enemy is the state government of São Paulo led by Alckmin (PSDB), a legitimate representative of the traditional neo-liberal right. The government’s stance on the strike so far has been one of extreme brutality with police repression of pickets at Metro stations, threats of dismissal, and intransigence in negotiations. The subway workers’ union is led by sectors of the trade union left, generally linked to the PSTU and PSoL parties, and has broad support in the sector. Most of the leadership is connected to the CSP-Conlutas federation, but the union is not affiliated to any union federation. Daily assemblies bring together more than 2,000 workers, out of about 9,500 in the sector. The pickets are organized to block the activities of sections of the bosses who are being mobilized to operate some Metro lines, endangering the population since the bosses are not trained to operate the Metro lines. The government is trying at all costs to turn public opinion against the Metro workers but has not been very successful. The Alckmin government and previous PSDB governments are directly implicated in a massive corruption scandal linked to the formation of cartels and paying bribes to state agents, involving big companies like Siemens and Alstom, suppliers of materials and services for the São Paulo Metro. In the preparation of the strike, the union made a series of denunciations of the Alckmin government’s policy for public transport. The union also proposed, in order not to harm the population with the strike, that workers would cancel the work stoppage in return for the opening of the turnstiles giving free Metro access to users! The proposal was well received by the population and even served to promote debate on the proposal for free public transport, which has gained popularity since June 2013. But the government has the support of the Labor Court which convened on a Sunday in order to deem the strike illegal, on the basis that the union does not guarantee the full functioning of the Metro during “peak hours” since this is an “essential” service. What remains of the right to strike if a classification of workers are supposed to maintain 100% of their work while on strike? The courts are imposing a fine on the union of one hundred thousand Real ($40,000) per day of strike action and has declared it legitimate to fire striking workers. Nevertheless, courageously, workers gathered in a massive assembly held on Sunday (8 June), decided to confront the government, media and courts, and resolved to maintain the strike. Right now, many sectors of the workers’ movement and social movements, including the MTST and youth organizations are mobilizing to build a mass action in support of the Metro workers. The strength and willingness of the Metro workers to fight, along with the organised popular support for the strike, are factors which may be able to defeat the government. Organizing active solidarity for the Metro workers and winning this fight could become a central factor for new struggles both during and after the World Cup. LSR (CWI in Brazil, the sister organization of Socialist Alternative in the U.S.), has struggled with all its might to build the unity of the ongoing struggles in Brazil today. Building the struggles together with the MTST while acting in CSP-Conlutas, the most dynamic grouping of the trade union left, LSR has struggled to get these two poles of struggle to act in a coordinated manner, which is now beginning to happen. As well as this, LSR has advocated in all these forums for the need for a national conference of the movements in struggle to build a common platform and a common plan of action. We have also argued that it is necessary to clearly move towards organizing a 24-hour general strike from below in the country. The united struggle of Metro workers, teachers, homeless and all workers and youth who are rising up today, awakened by the inequalities of the World Cup, is a prerequisite for the reorganization and reconfiguration of a combative workers’ movement and socialist left in Brazil.